From Old Turn this is a walk along the Birmingham Main Line (new and old) into the Black Country. Leaving the swish apartments of the City Centre and Oozells Street Loop behind, look out for the 'Roundhouse', a striking horse shoe structure, originally a warehouse and stables. Dereliction and graffiti is unremitting as you pass the eastern end of the Icknield Port Loop, these loops were part of the meandering Old Main Line built by James Brindley, and contrast with Telford's very much straighter New Main Line. At Rotton Park Junction take the Soho Loop and, after a fairly unpromising start if you're not an industrial archaeologist, there's parkland and a neat housing estate. All but hidden opposite is the City Hospital. 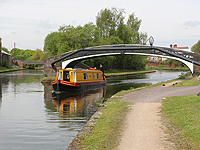 At Hockley Port Junction, the Soho Branch once served the Soho Manufactory, the world's first modern mass production factory, it now accommodates a few boats. Winson Green prison appears on the horizon and you pass the forbiddingly named Workhouse Wharf and Asylum Bridge. The loop is 1¼ miles long before rejoining the main line. You'll then pass the Winson Green Gauging Island and the disused Cape Arm before the canal dips under the Avery Rail Bridge and passes the site of the Soho Foundry. It was here that Matthew Boulton and James Watt built the steam engines that powered the industrial revolution including the one used in the original Smethwick Engine House. Bear right following the Old Main Line at Smethwick Junction to Smethwick Locks that had to be constructed due to the geological difficulties of building a tunnel. However, there was a constant lack of water and pumping engines were therefore employed to return water to the summit. The summit was also lowered and the number of locks halved, with a duplicate set of locks inserted at the Smethwick end, which are the ones that survive today. Two of the other solutions are still very apparent, Telford's Engine Arm that was built in 1825 to feed water from Rotton Park Reservoir can be explored until you reach private moorings, and the Smethwick Pump House, which replaced the original Engine House in 1892, pumping water from the new to the old line. After the Summit Tunnel, there's a pleasant stretch and even a nature trail. But any thoughts that you've entered a rural idyll are run over by the M5, and the environment becomes dark and claustrophobic. Crossing over Spon Lane Bridge you are hemmed in by motorway pillars but bear right and daylight returns along Spon Lane Locks, reputed to be the oldest working locks in the world, where the canal falls 20ft to Bromford Junction. Turn left at the junction onto the New Main Line and huge columns supporting the M5 occupy the middle of the canal. After going under the Stewart Aqueduct carrying the Old Main Line, there's plenty to keep your interest on the way back to Smethwick Junction. The derelict buildings that you pass on the left are where Chance Brothers were based for 150 years, innovative glassmakers who glazed the Crystal Palace, the four faces of Big Ben and lighthouses throughout the world. Where there is a lighthouse, there is probably still Chance glass. Following Spon Lane Bridge a more verdant landscape takes over and birds try to make themselves heard above the rumble of the motorway. Galton Bridge and Tunnel are then reached, the bridge is a single span of 151 feet and was once the highest in the world, the tunnel by contrast is boring modern concrete. Then, just before the Smethwick Stop, you have the privilege of admiring from below the finely detailed cast iron of the Engine Arm. After Smethwick Junction and Towing Path Bridge, industry kicks in with a vegenence. Take the right towpath and you'll have a good view of the Soho Foundry. However, the outlook very gradually becomes greener, with trees lining the towpath and elegant Horseley Bridges decorating the canal, but then you get back to the Icknield Port Loop which has no redeeming features. Luckily the City Centre isn't too much further.